Navetta is the term Italians apply to serious cruising vessels. 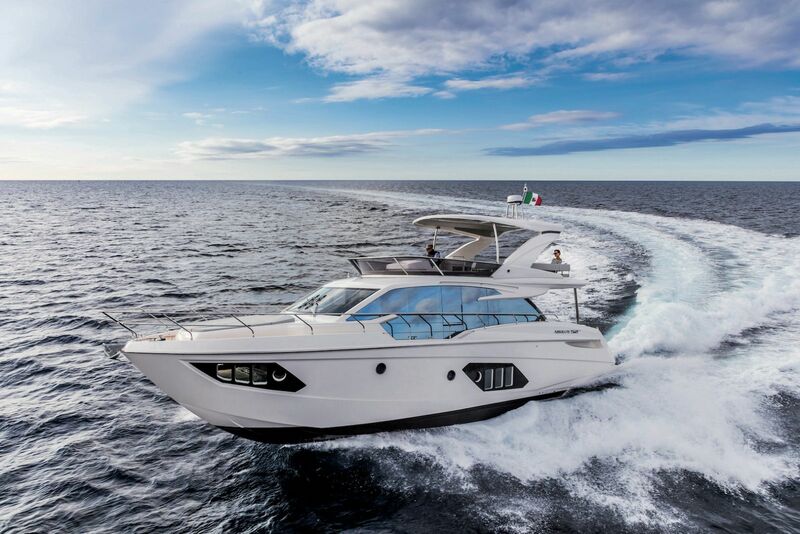 The Absolute 52 is an exceptional coastal cruiser and certainly worthy of the term "Navetta". The step up in attention to detail has paid off massively in Absolute’s Navetta Series. Many practical, comfort-inducing details are found all over the boat: a 21-inch-wide door to the head; 6 feet 7 inches of headroom in the shower with a 21 inch wide head entry door; a 56-inch flat-screen TV in the main salon. Those numbers mean a lot when you’re on board. The designers thought about the minute details that improve your overall cruising lifestyle. Beneath the distinctive Italian exterior is a comfortable, quick, coastal cruiser. Absolute’s abilities in terms of hull design, construction, and engineering is unintimidated by inhospitable waters. The 52 remains steady in chop, running up-sea with minimal pounding and running true down-sea. She turns without hesitation in confused seas and her ride is solid. The 52 Navetta design is aimed at the boater who wants to make extended passages in comfort and style. Dockside, her plumb bow, upright superstructure, large glass windows and copious foredeck seating will stand in stark contrast to boats that surround her. As you head out on your next voyage be prepared to turn many heads among boaters, with admiration and the occasional envy. If you consider the 52 Navetta you’re bound to be intrigued by evidence that the Absolute Yachts shipyard has done its cruising homework. Wide side decks are sheltered by superstructure overhangs and protected by generous fiberglass bulwarks. The cockpit is fully protected, covered by the bridge overhang so that it’s usable in any weather. An additional overhang forward enhances visibility from the lower station and provides shade for those seated on the aft foredeck lounge. Safe and easy foredeck access is always a pleasure for the cruising family. And that’s what we have here in the 52 Navetta. The foredeck seating is a serene place from which you can enjoy the ride and it’s sunpad is positioned to leave plenty of open deck space to maneuver around, this will also make for an easier docking experience. Absolute’s careful weight management, along with a rather unusual hull design keeps this boat dry even when maneuvering in tricky seas. The aft galley layout works well on this 52 footer, placing the nicely equipped galley, full sized domestic fridge and an adjacent dresser with dedicated storage for all your cutlery, plates and glassware, the soft touch drawers are also a nice touch. The galley’s electric glass partition leads into the salon’s vast seating area equipped with an extendable dining table. Huge windows allow lots of natural light and make this a very sociable area to gather, dine and watch television. The layout also shortens the chef’s trip with food and beverages to both the cockpit and the bridge. Heading down the companionway you’ll notice the superb headroom, this continues all the way through each stateroom. The master and VIP staterooms have ensuite heads finished with marble counter tops and high end detailing. The finish and execution onboard is very impressive. Sliding pocket doors allow for additional room to move about. Stand up running properly from the lower helm who’s layout is smartly arranged and lovely with Carbon Effect dash and large side door. With quite a lot going on at her transom, you’ll have the option of a hydraulic swim platform, barbecue and crews quarters. The crew’s berth flips up for even more space while not in use. Use this area for storage or a game room. The aft grill located about the swim platform near the Crews quarters is optional. While grilling your favorite foods this option keeps smoke away from the boat and grease off of your teak. While standing on her hydraulic swim platform just drop the platform into the water and the sausage your grilling just rolls in, the BBQ positioning also keeps smoke away from the boat. The bridge is bound to be a popular dining venue onboard with it’s generous sized port-side U-shaped dinette. is very social. A midship captains chair with adjacent u-shaped seating, a wetbar and grill with a close molded lid equally impressive. 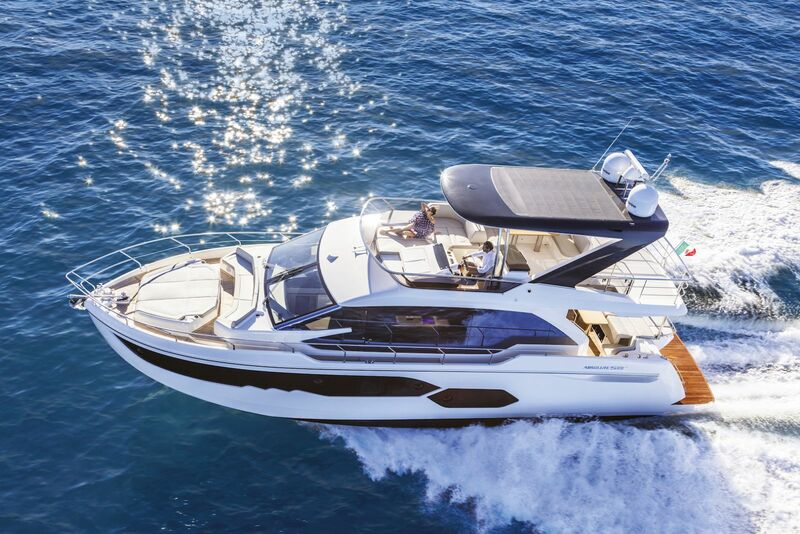 The 52’s hardtop provides solid shade above its long flybridge. If you wish to move around underway the chrome handrails are an inviting and safe convenience. The flybridge aft deck is left open for two sun lounges, or deck chairs. Twin 435 hp D6 Volvo Penta diesels matched with IPS drives push the 52 to a top speed of 24 knots. 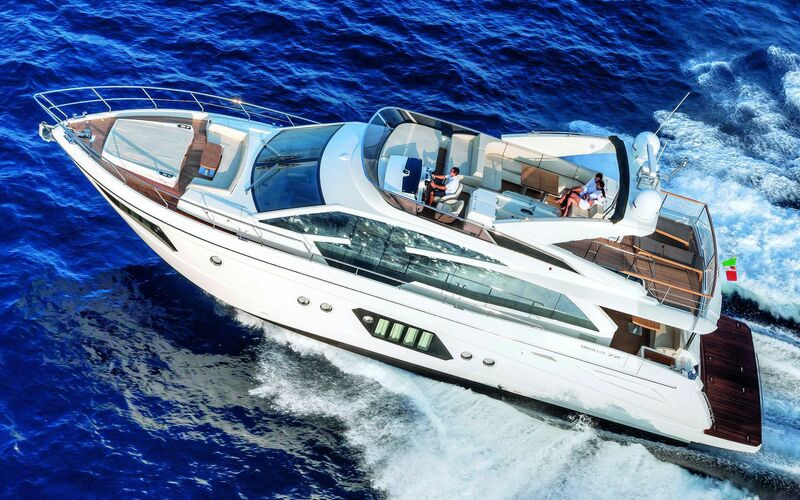 She has a cruising speed of 14 knots, at which the diesels consume just 1.76 mpg. The centerline flybridge helm, with twin 12-inch Garmin displays on either side of the steering wheel, offers excellent visibility. Maximizing space is the goal below deck for Absolute Yachts. The vessel’s beam doesn’t pinch and the master stateroom feels full-beam with an en suite head, desk with vanity, walk-in closet and large hullside windows. As in the rest of the interior, Canaletto walnut joinery works well here with the oak soles. Absolute added some luxe touches like an ivory-colored leather sofa and a dark leather headboard. All the staterooms on Absolute’s 52 Navetta use the same fine materials, with an equal level of fit and finish. Absolute’s clever design for its VIP stateroom, placing the queen-size bed at a 45-degree angle to port, creates a true walk-around berth. It gives guests a great view through the hullside windows, a flat-screen TV is built into the cabinet on the opposite side to the berth. This layout makes the 52 seem like a much larger yacht. Entering the salon, you can see how owners might spend months on board. Vast ocean views and sight lines are superb thanks to 360 degrees of windows. The 6-foot-10-inch headroom, low cabinets and smart positioning of the galley aft enhance the sense of space. The galley is equipped with a full-size refrigerator, stove, dishwasher and specially designed drawers for all of your cutlery. The frost-glass partition on an electric lift separates the galley from the salon and is worthy of the moniker a cook’s “sanctuary”. The lower helm offers good visibility and access to wide side decks through a heavy-duty door that seals weathertight. Between the galley and helm are a leather lounge and table (extending to 56 inches), with a lounge just across the way. 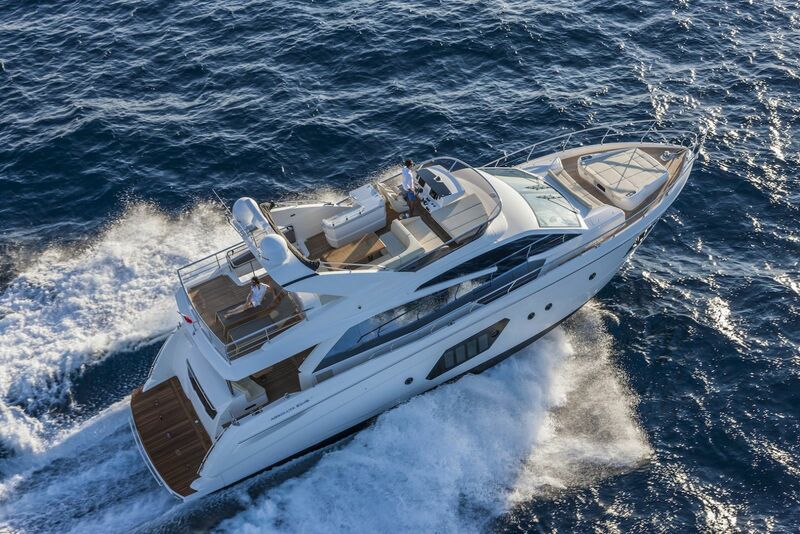 Running the Absolute 52 Navetta’s lower helm enjoy standing up properly when running the boat. Side door access to decks and venitilation as well. Comfortable, quick passage maker, very quiet. Stainless-steel grab rails inset into the headliner overhead, offering a place to steady yourself during rough passages. By itself, that feature is notable and noticeable throughout, but Absolute took the design element a step further by wrapping the grab rails in white leather, making them functional and decorative. This is a quality machine, with top-notch moldings, beautiful woodwork, a solid ride and excellent practical detailing. Absolute was an early adopter of IPS and therefore knows a thing or two about making Volvo’s pod system hum, hence why the 52 delivers a mix of secure ride, punchy enough performance and perfectly weighted handling. The Navetta series is the most well-known model range of the Absolute Yachts family, with the 73 being the company’s flagship model. Known for being seaworthy and able to accommodate living on the boat for extended trips, the Absolute Navetta is the perfect vessel for your life’s journeys. And with Volvo Penta IPS engines powering her, any member of the Navetta fleet shows amazing efficiency and performance numbers while cruising quietly and with no vibrations. There are currently three models in the Absolute Navetta model series including the 52, the 58, and the aforementioned 73. Absolute Yachts has released the official video trailer that shows off the incredible Navetta 52.